Joaquin Navarro-Valls, the chief Vatican spokesman, said of John Paul II’s trips, “Early on, he realised he could not run the church from the Vatican, so he decided to...increase the authority of the papacy by going directly to the people....” For instance, he often used his visits to South America to personally oder local churchmen to stop practicing “liberation theology” and working with the poor to promote social justice. Papal trips are as ambiguous as the Vatican itself, which claims the benefits of being both a state and a religion. As "state visits" they are paid for by the host country, unlike the trips of any other religious leader. And as "pastoral visits" they lend themselves to the dispensation of politically-charged "moral guidance" which would be a breach of protocol for the head of any real state. It has been argued that the rationale behind John Paul's travels was to counter the liberal reforms of the Second Vatican Council. They enabled him to evangelise at his World Youth Days at his hosts' expense, issue "moral guidance" on their proposed laws and rein in their "liberation theologians". These trips substituted the group excitement of huge public events for the stimulation of the new ideas of Vatican II, which were frowned upon by the Polish pope. 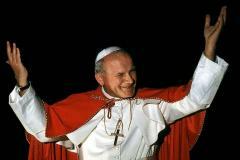 He inaugurated World Youth Days, with papal appearances on a huge stage and much music. This enabled the media-friendly, but very conservative Pope to directly evangelise young people in their own idiom. John Paul's travels can be seen as a way to counteract the decentralising and liberal tendencies fostered by Vatican II. Many of John Paul's trips appear to have had specific political goals. ♦ The 1979 visit of John Paul II dubbed the "Hallelujah weekend of Ireland" coincided with that country's first tentative step towards legalising contraception. The pope devoted that trip to promoting "motherhood". ♦ In 1985 and 1990 he made two papal “pilgrimages” to the Ivory Coast. The first was to bless the foundation stone for a basilica and the second to consecrate the largest church in the world — an African dictator’s full-sized replica of St Peter's Basilica. The Vatican followed up three years later by concluding a very profitable concordat. ♦ His visit to Portugal in 2000 came just as the concordat negotiations were starting, a "treaty" which gave the Church a number of new privileges. ♦ His 2003 trip to Slovakia seemed to be timed to try to prevent parliament from legalising abortion and also to nudge along the negotiations for the "conscience concordat" before Slovakia joined the European Union. ♦ to get these concordats in place before they entered the EU. The reason for this is that the ground-rules of the EU (Declaration 11 of the 1997 Treaty of Amsterdam) effectively protect church-state relations that are already in place from human-rights objections. In fact, the Vatican had to shelve the "conscience concordat" in Slovakia precisely because it didn't manage to get it through before that country joined the EU. Pope John Paul II made 104 state visits to 129 countries outside of Italy (as well as 146 within Italy, which are not listed here) and received many heads of state at the Vatican. 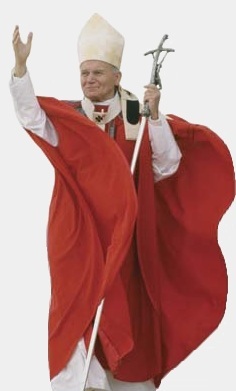 The Pope strikes a dramatic pose on a huge stage at the windy Maastricht airport in 1985. The Netherlands was one of fifteen countries he visited that year. The next year it was ten more, including Australia, where the papal trip was said to have cost $400 a minute. 1978 elected 16 October and, as the first non-Italian pope of modern times, tactfully makes pilgrimages to the tombs of the patrons of Italy (St. Francis, and St. Catherine). 1979 visits the Dominican Republic, Mexico, the Bahamas, Poland, Ireland, the USA and Turkey; receives the Foreign Minister of the Soviet Union, addresses the U.N and becomes the first Pope to visit the White House. 1980 visits Zaire, the Congo, Kenya, Ghana, Burkina Faso, the Ivory Coast, France (addressing UNESCO), Brazil, West Germany; receives the President of Portugal, President of the USA, Queen of Britain and President of Yugoslavia. 1981 visits Pakistan, the Philippines, Guam, Japan and the USA; receives a Polish Solidarność delegation – all this before 13 May when he is shot in St. Peter’s Square, which ends his trips for the rest of the year. 1982 visits Nigeria, Benin, Gabon, Equatorial Guinea, Portugal, Britain, Brazil, Argentina, Switzerland, San Marino and Spain; receives the President of Greece, President of the USA, President of the Palestine Liberation Organisation and President of West Germany. 1983 visits Portugal, Costa Rica, Nicaragua, Panama, El Salvador, Guatemala, Honduras, Belize, Haiti, Poland, France and Austria. 1984 visits South Korea, Papua New Guinea, the Solomon Islands, Thailand, Switzerland, Canada, Spain, the Dominican Republic and Puerto Rico; receives the President of Italy. 1985 visits Venezuela, Ecuador, Peru, Trinidad and Tobago, The Netherlands, Luxembourg, Belgium, Togo, the Ivory Coast, Cameroon, Central African Republic, Zaire, Kenya, Morocco and Liechtenstein; receives the Prime Minister of Israel and Foreign Minister of the USSR. 1986 visits India, Colombia, St Lucia, France, Bangladesh, Singapore, Fiji Islands, New Zealand, Australia and the Seychelles; receives the President of Lebanon, Governor General of Canada and President of Cameroon. 1987 visits Uruguay, Chile, Argentina, Germany, Poland, the USA and Canada; receives the President of Poland, President of the USA, President of Austria and President of Argentina. 1988 visits Uruguay, Bolivia, Peru, Paraguay, Austria, Zimbabwe, Botswana, Lesotho, Swaziland, Mozambique and France; receives the President of the Philippines. 1989 visits Madagascar, La Réunion, Zambia, Malawi, Norway, Iceland, Finland, Denmark, Sweden, Spain, South Korea, Indonesia, Mauritius; receives the President of Ireland, President of the USA, Archbishop of Canterbury (England), President of the USSR and President of Malta. 1990 visits Cape Verde, Guinea Bissau, Mali, Burkina Faso, Chad, Czechoslovakia (Prague and Bratislava), Mexico, Curaçao, Malta, Tanzania, Burundi, Rwanda and the Ivory Coast; receives the President of Portugal. 1991 visits Portugal, Poland, Hungary and Brazil; receives the President of Poland, President of Chile and King of Sweden. 1992 visits Senegal, Gambia, Guinea, Angola, São Tomé e Príncipe and the Dominican Republic. 1993 visits Benin, Uganda, Sudan, Albania, Spain, Jamaica, Mexico, the USA, Lithuania, Latvia and Estonia; receives the President of Slovenia, President of Slovakia and President of Argentina. 1994 visits Croatia; receives the President of Germany, President of the Czech Republic, Prime Minister of Israel, President of the USA, President of Austria and President of Lithuania. 1995 visits the Philippines, Papua New Guinea, Australia, Sri Lanka, Czech Republic, Poland, Belgium, Slovakia, Cameroon, South Africa, Kenya and the USA, (addressing the UN there); receives the President of Malta. 1996 visits Guatemala, Nicaragua, El Salvador, Venezuela, Tunisia, Slovenia, Germany, Hungary, France; receives the President of France, President of Mexico, Archbishop of Canterbury (England) and President of the Palestinian Authority. 1997 visits Bosnia and Herzegovina, Czech Republic, Lebanon, Poland, France, Brazil; receives the Prime Minister of Israel, President of Brazil and President of Georgia. 1998 visits Cuba, Nigeria, Austria, Croatia; receives the Secretary of State of the USA, King of Belgium, the President of the Palestinian Authority and President of South Africa. 1999 visits Mexico, the USA, Romania, Poland, Slovenia, India and Georgia; receives the President of Iran and Minister of Foreign Affairs of Israel. 2000 visits Egypt, “the Holy Land” (Jordan, Israel and Palestine), Portugal; receives the President of the Palestinian Authority, President of the Russian Federation and Queen of Britain. 2001 visits Greece, Syria and Malta (in “the footsteps of St. Paul”), the Ukraine, Kazakhstan and Armenia (to mark 1,700 years of Christianity there). 2002 visits Azerbaijan, Bulgaria, Canada, Guatemala, Mexico and Poland; receives the President of the USA. 2003 visits Spain, Croatia, Bosnia and Herzegovina and Slovakia. 2004 visits Switzerland and France; receives the President of the USA and Prime Minister of the interim government of Iraq. 3. New York Times, ibid. 4. T. Crosthwaite, "The Vatican and the Falklands War", 2010. http://www.wallsofjericho.info/index.php?option=com_content&task=view&id=33&Itemid=68 Highly recommended. 5. New York Times, ibid.